Combining the best of traditional and mission styles results in this handsome and versatile open bookcase. Four fixed shelves provide you with plenty of room for books, pictures, or your favorite accents. 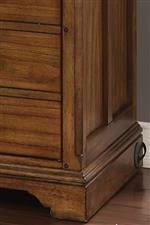 A warm vintage oak finish adds personality to the piece by highlighting the natural grain of the wood veneers. The Sonora Mission Open Bookcase by Flexsteel Wynwood Collection at Olinde's Furniture in the Baton Rouge and Lafayette, Louisiana area. Product availability may vary. Contact us for the most current availability on this product. The Sonora collection is a great option if you are looking for Mission furniture in the Baton Rouge and Lafayette, Louisiana area. 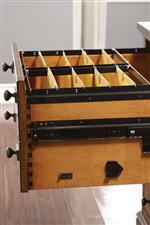 Browse other items in the Sonora collection from Olinde's Furniture in the Baton Rouge and Lafayette, Louisiana area.